Located on the east coast of South Africa, Durban is a prominent port city, home to nearly 3.5 million people. Famous for its subtropical climate, flourishing trading sector and sprawling beaches, this friendly city attracts local and international visitors all year round. Home to delectable cuisine and a vibrant nightlife, the city also boasts lush scenery and wildlife. Cheap flights to Durban are now available for a limited period of time, so get ready to enjoy the golden beaches of South Africa’s spectacular coastline! Durban is home to King Shaka International Airport (DUR), which is 30-minute drive from the city. Soak up South Africa’s sun-kissed beaches sprawling the golden coastline of the warm, blue Indian Ocean. 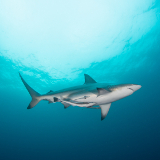 With clear waters and plunging, white-lipped waves, this city is a surfing and diving paradise! From vintage hideaways to trendy sidewalk cafés, you’ll be spoilt for choice with the culinary offerings Durban has to offer. Tuck into some spicy, Indian curry and peruse the harbour front for the freshest seafood catch. For culture lovers, Durban hosts a number of vibrant festivals all year round. 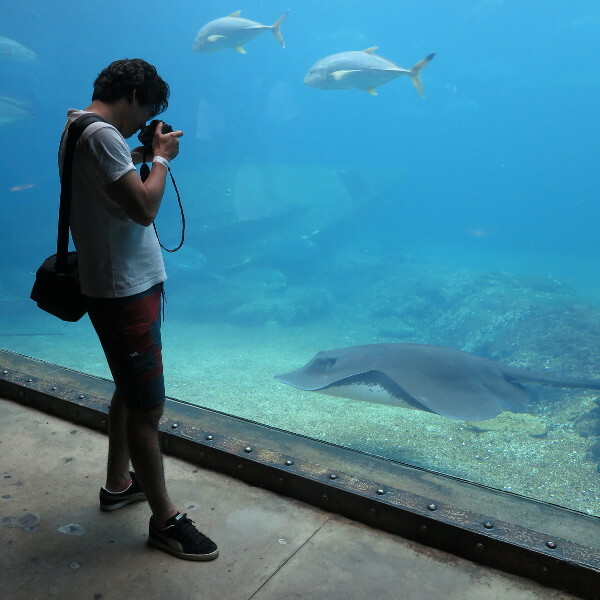 Spend a day exploring uShaka Marine World, while the city’s Hindu temples and botanical parks provide a calm oasis of reflection and relaxation. Durban experiences a subtropical climate with hot, humid summers and pleasantly cool winters. The winter season (June-August) is a popular time to visit, as rainfall and humidity are at their lowest and the cool, balmy weather makes outdoor activities enjoyable. The Good Food and Wine Show and the Durban International Film Festival are not-to-be-missed highlights of the season. The shoulder seasons of autumn (April-May) and spring (September-November) are also ideal times to visit, when crowds have dispersed and accommodation prices are more budget-friendly. Catch the Nottingham Road Pink Festival in November, where you’ll be treated to music, dance, theatre and culinary delights during this two-day event. If you want to hit the golden beaches, the summer season (December-March) provides plenty of outdoor activities. Keep in mind that December is school and Christmas holidays, resulting in a huge influx of tourists. If you don’t mind the occasional thunderstorm and inflated holiday prices, book your ticket today! Durban is a prominent port city in KwaZulu-Natal on the east coast of South Africa. 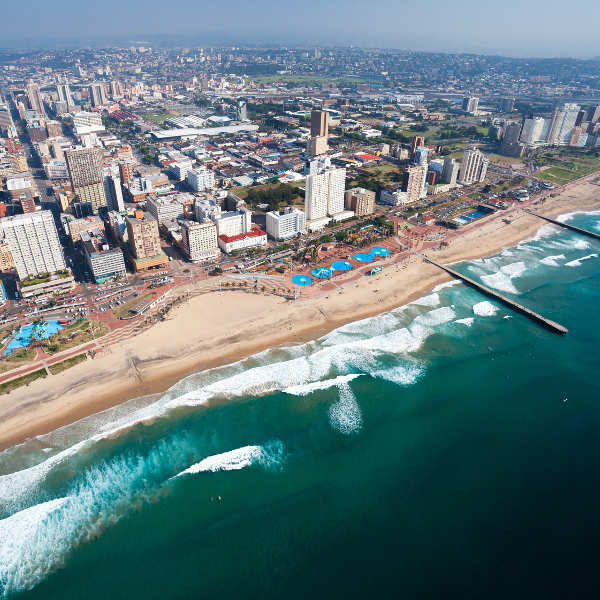 Previously inhabited by British and Indian settlers, Durban’s history as a trading port and sugar cane plantation placed it on the map, and today the city is a major tourist attraction. Golden beaches offer some of the best surfing, diving and snorkelling in the country! The Golden Mile stretches along the coastline of the Indian Ocean – a popular spot for surfing and beachfront dining. 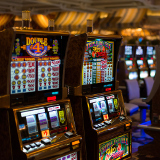 Experience Durban’s thrilling nightlife at Suncoast Casino and among the quaint cafés and bars along Florida Road. 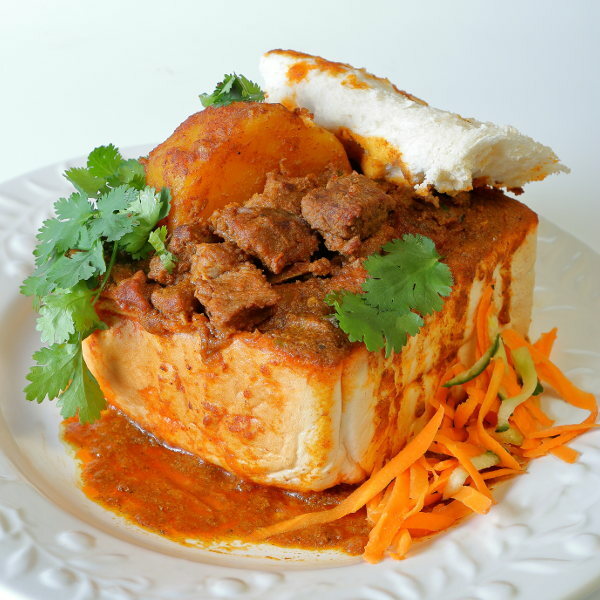 Don’t leave without getting your hands on the famous Durban Bunny Chow, or traditional Indian curry and fresh seafood. Relax in the beautiful gardens and parks peppered around town. 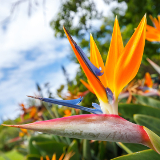 The Botanical Gardens, Umgeni River Bird Park and Crocodile Creek provide unique adventures into exploring the vegetation and animal life in the city’s lush landscapes. There’s always something to do in Durban and if you’re a local, you probably have some favourite spots that you’ll always return to. It’s a great destination for beach-lovers, where the warm sapphire waters and toasty temperatures are perfect for a year-round summer holiday! Compare several airlines, and book your cheap flights to Durban online at Travelstart! The locals in Durban are incredibly welcoming and are always happy to assist tourists with finding their way around. Like any modern metropolis, Durban is a fairly safe city but petty crimes are common, especially towards tourists. Be vigilant at all times and keep an eye on personal belongings. As a precaution, carry money and cards in a travel purse secured under your clothes or ensure bags are always zipped closed. It is not advisable to walk around at night, especially for solo female travellers. Uber and Taxify are reliable taxi services to transport you around the city. You can also ask your hotel to advise you on the safe zones within the city, which they will gladly point out. There are no required vaccinations for entering South Africa. However, proof of yellow fever vaccination is required if you are travelling from an infected areas. Durban experiences hot, humid weather so a good sunblock and insect repellent is essential. Tap water is perfectly safe to drink and you can order a glass of water in restaurants at no charge. The city has excellent medical facilities and pharmacies where you’ll be able to purchase a wide range of products. The Durban city centre has a few options for bargain hunters, from backpackers dotted along the famous Florida Road and Morningside, to couch-surfing across the city. Mid-range forms of accommodation include beautiful guest houses, campsites and Airbnb’s. You can find more upscale accommodation in the form of hotels and private beach houses. Some of the best areas to stay in are Umhlanga, Ballito and Margate – a stone’s throw from the golden beaches. For a quiet getaway, the Drakensberg Mountains are perfect for hiking and camping, boasting stunning views of the evergreen mountain ranges. Wherever you choose to stay, Durban has many options to suit every taste and budget! The best way to get around Durban is by car, which can be rented at the airport or in the city centre. International visitors opting to rent and drive themselves around will need an international driving license. If you do not have one, ensure you have your foreign driving license with a certified English translation (if required). Alternatively, you can make use of Uber or other registered taxi services to get around. Minibus taxis are commonly spotted by their loud music, colourful façade and locals hanging out of the windows scouting for passengers. While these may seem fun to try, the drivers are often reckless and taxis overcrowded. The promenades and harbour strips are perfect for some lazy summer strolling, and if you get tired, you can take a rickshaw ride along the beachfront, enjoying the stunning sea views.